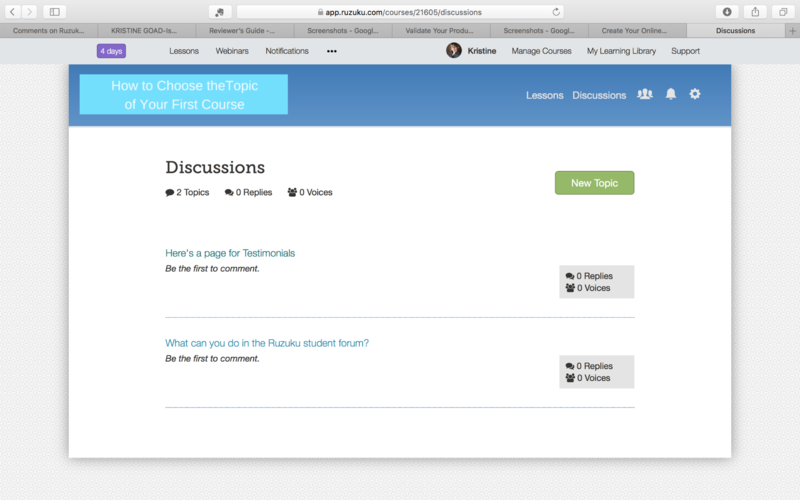 Ruzuku Review: Is It Really "Ridiculously Easy Online Course Creation"? 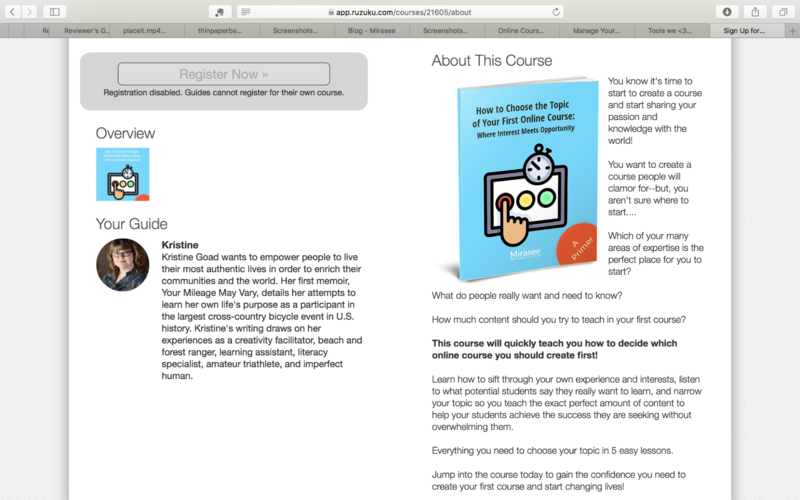 Home » Blog » Is Ruzuku Really Ridiculously Easy Online Course Creation? Confession : When I signed up for the Ruzuku 30-Day Course Creation Challenge in April, 2015, I failed. 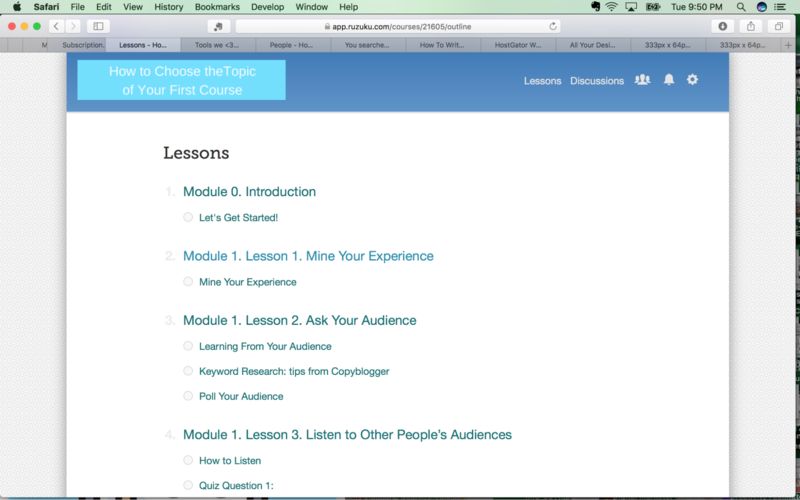 Ruzuku’s tagline is “Ridiculously Easy Online Course Creation.” So, how could I fail? It wasn’t because I couldn’t finish in time or because I couldn’t figure out how to use the platform to create my online course. It was because I didn’t even try. I was still dreaming about what I wanted my business to be, and I had signed up for the challenge because it sounded fun and exciting. It had the word “challenge” in the title, after all! But, as with so many shiny new objects, it quickly lost its appeal in the midst of all the “real life” challenges I was already dealing with. So when I was asked to review Ruzuku for Mirasee, I had an opportunity to see what I’ve been missing the last two years. It turns out, I’ve been missing a lot! While it could be argued that no LMS (Learning Management System) can be all things to all people, the versatile Ruzuku platform just might come close. 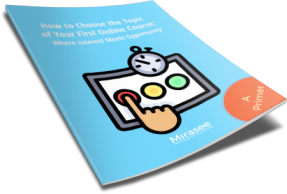 The company claims you can create your online course in 2 hours or less, and my experience—even as a complete course-creation newbie—bears that out. To test how easy it is to use, I began creating my course without reading any of the extensive documentation in the Knowledge Archive. 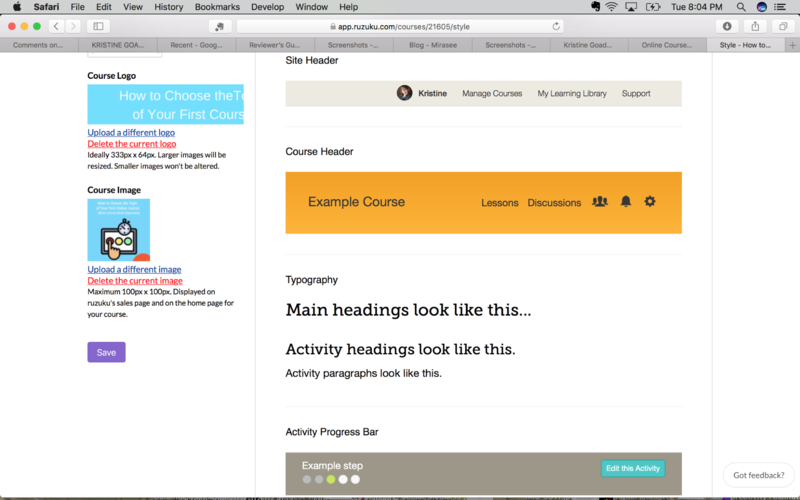 The platform leads you step-by-step, from naming your course to adding each lesson’s name, description, and content. You can choose to either upload video or audio files for hosting directly on Ruzuku’s site (with no limit to the number of files you can upload), or embed them if they are already hosted on another web or cloud source, as well as upload documents, and link to external webpages. In a nutshell, it lets you share your content in whatever form you choose and can be as simple or as customized as you’d like. So Was it Ridiculously Easy? The first big obstacle I encountered was when I tried to create a quiz. I was using the 14-day free trial that claims to grant access to full course-building functionality. I assumed that meant I had access to quizzes. But that’s a feature Ruzuku reserves only for it’s highest payment tier (University). When I consulted Ruzuku’s Knowledge Archive, it said I should see an “Add Quiz” link next to the “Add Activity” link, but I did not. So, I created my own workaround. 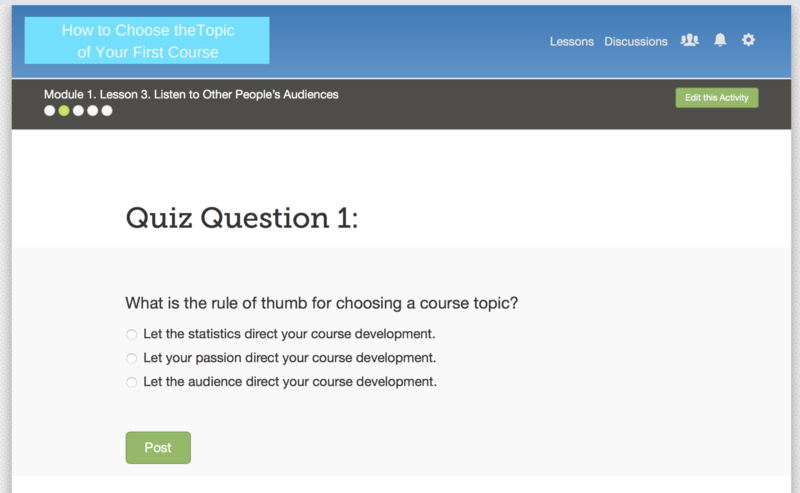 Ruzuku makes it easy to include a single-question poll in each lesson. To create my 4-question quiz, I simply created 4 polls. Ruzuku recommends creating a quiz using another online tool (ProProfs is their top pick) and linking to it in your lesson. That’s a great suggestion, but I don’t mind the way my quiz turned out, and it was quick and easy to create. 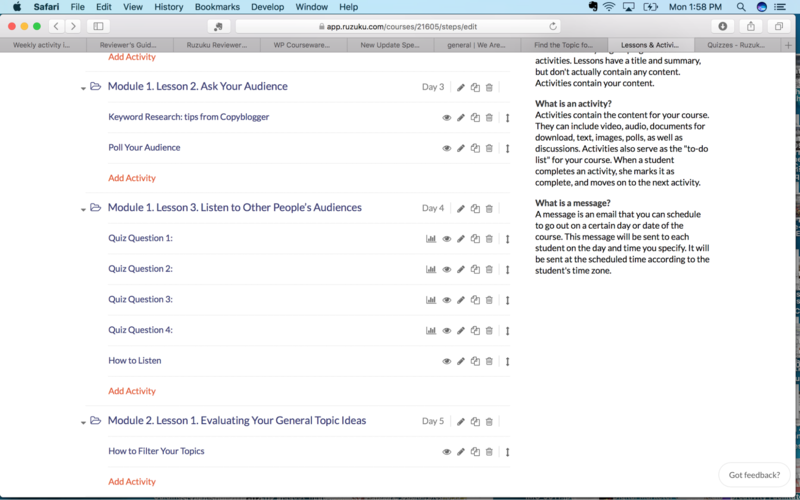 The rest of the course creation process went smoothly and quickly, and even though I did consult the Knowledge Archive on a couple occasions, I had all of my course content uploaded in the two-hour window. The second obstacle I encountered, and was not able to resolve within Ruzuku, was that of sending each student a certificate of completion. Ruzuku does not allow for individual email communication between the instructor and a student within the platform and it does not offer any sort of badge or certification system. 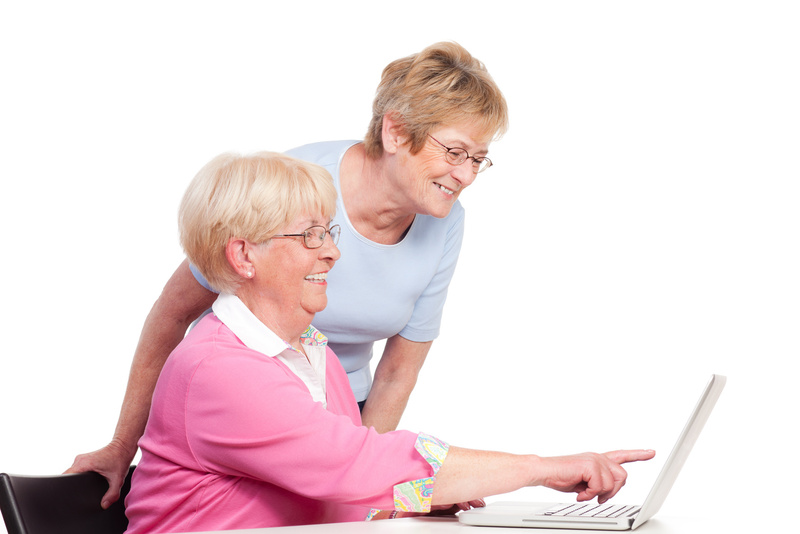 However, as an instructor, I do have the ability to view student progress and to download student email addresses to my personal email account or contact management system. That would make it possible for me to manually create a certificate and email it to each student who completes the course. However, that could quickly become too much work, especially when you have a large number of students and a high completion rate. An automated process is best. To polish the look of your course, the platform allows you to choose from among 7 color schemes and 4 fonts, as well as upload a logo (of the course’s name) and a cover image. It gives the required image sizes, so you can easily create them using Canva or whatever design program you prefer. 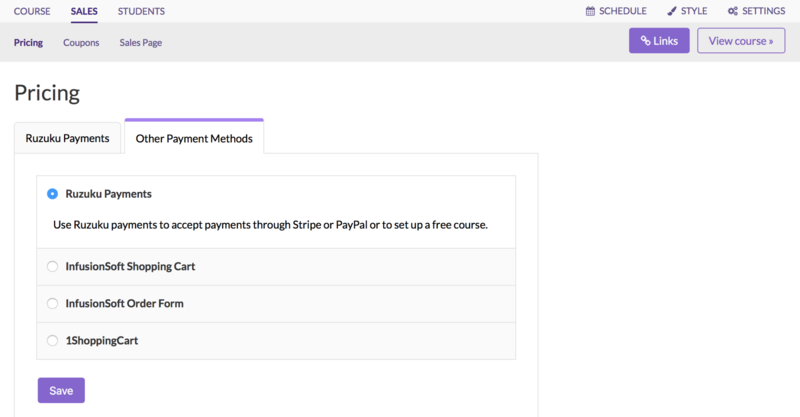 Then, it’s just a matter of choosing a price point—and, yes, free is an option—choosing how you want to get paid (Ruzuku integrates with Stripe and PayPal for all program tiers, and also integrates with 1ShoppingCart and Infusionsoft for instructors using the Up-and-Comer and University tiers), selecting a date for your course to go live, and adding a course description to create your simple sales page. Customer Support Super quick, friendly, and helpful responses to both of my support requests from someone who clearly loves her job! What I like most about Ruzuku is its combination of simplicity and flexibility. It is easy and intuitive to use, with a simple, clean design for the first-time course creator, but it will also allow users with more design experience to create a more customized look. Its sophistication level meets you where you are, so frustration is minimized! 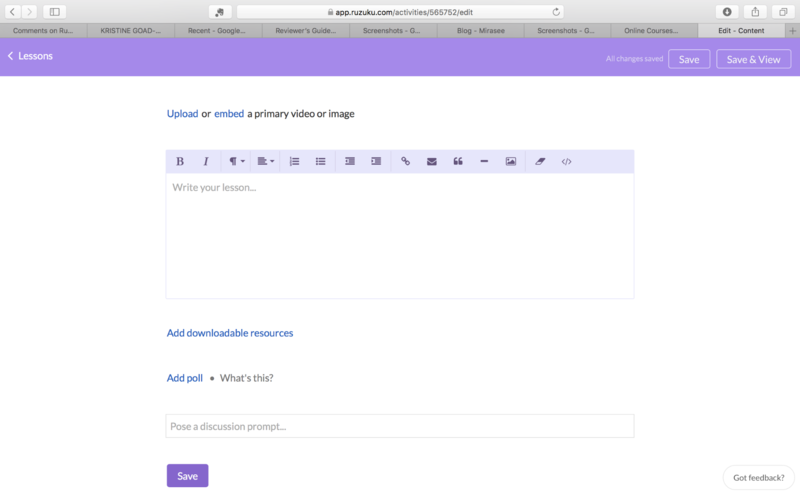 When you’re creating your content with the visual editor or adding resources for your students to download, you can get fancy or keep things simple. And as you experiment with the outside tools Ruzuku recommends for creating quizzes, graphics and infographics, audio files, and great images, you can get more creative with your teaching tools. The flexibility aspect comes into play, also, with the pricing and information delivery options (whether you want a student to have access to all the modules immediately or you want to drip content over time). You can copy your course and run it again and again, testing out different price points, coupon codes, content, and content formats—or even have the same course running in an evergreen, self-study format while you’re simultaneously running a high-touch group program. This makes it a great fit for students in Mirasee’s Course Builder’s Laboratory who want to run their course as a pilot once or twice before scaling up to a full course. It’s also good for anyone who wants to be able to run experiments with their courses to find pricing and content sweet spots. 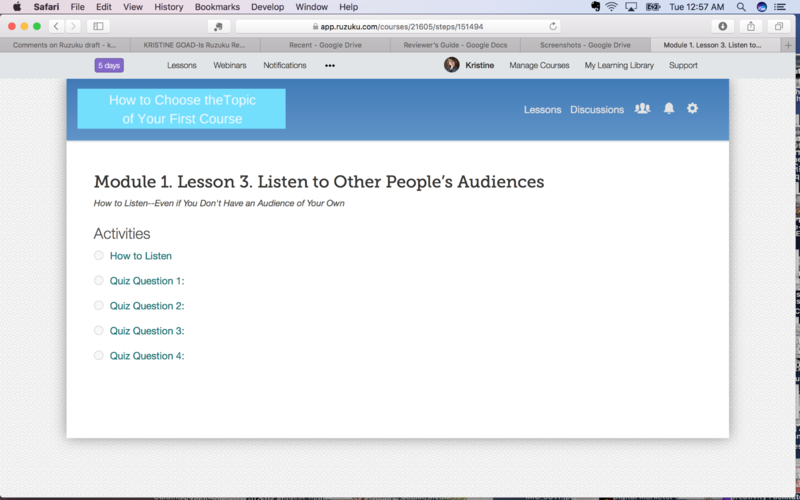 directly on the content pages of your course in a discussion section at the end of each lesson. When students sign up for your course, they are encouraged to upload a photo and bio, and course creators are encouraged to end each lesson with a discussion question. This creates an environment where people can get to know each other, without the need to use another platform, such as Facebook with which many course creators have a love/hate relationship. Then, after your course finishes, you can invite your students—who already know and trust you and their course mates—into an alumni community on another platform to continue the conversation, if you wish. The least attractive feature for me is the sales page. 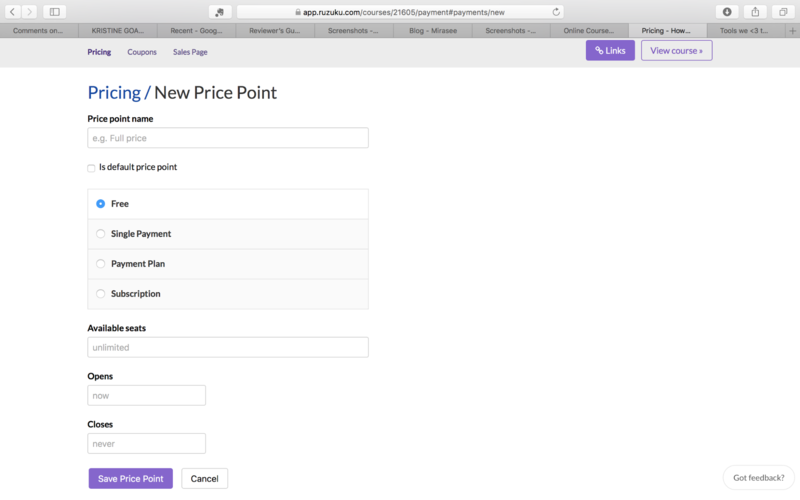 Like everything else in Ruzuku, the sales page is clean and simple and completely functional. But since this just may be that crucial first interaction someone has with me and what I have to offer, this is the place where I’d like to be a little more creative and have a little more design flexibility. The cover photo is too small (the image on the left under the word “Overview”), I’d like more options for moving things around and customizing the look of the page, and I’d like to be able to upload a video. Oddly, this is the one place that doesn’t allow users to add video except by linking to one hosted on an external source. Because this page leaves me feeling a bit confined in my ability to communicate the way I want with a potential student, I’m not confident that I’d be able to sell a high-priced course from this sales page alone. That being said, it’s probably not wise to expect any sales page to do all the heavy lifting in selling a higher priced course! So if I were building courses on Ruzuku and using their sales page (rather than hosting a sales page on my own website), I would plan on doing a video series, sales webinars, or sales calls—or some combination of these—so that by the time my potential students reached the sales page they were already familiar with me and the course and were mostly just looking for the place to sign up. It’s a small complaint given the ease of the site, and I might prove myself wrong about not being able to sell well from it. 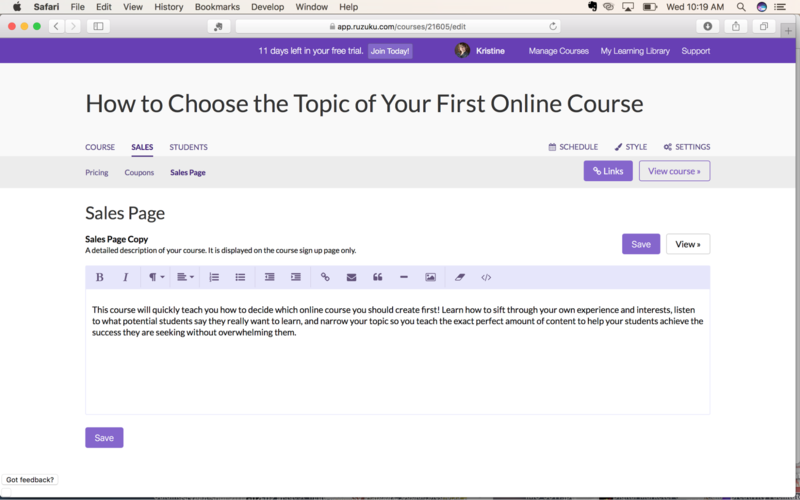 So while it’s hard for me to say anything is “ridiculously easy,” I would be hard-pressed to find ways to make online course creation any easier than Ruzuku has already made it. Ruzuku is best for someone who wants to get started on course creation quickly, who wants all of their tech to be fairly straightforward and in one place, and who wants to be able to experiment quickly and easily with the courses they deliver. It’s also great for someone who wants a platform that’s going to allow them to go further in their design as they get more comfortable creating course elements in other software and importing it into Ruzuku. Sign up for the 30 Course Creation Challenge—and actually complete it! Read the “Tools We <3 to Build a Course” document in the Knowledge Archive and check out the ones that interest you. Maximize your momentum by making a plan and a commitment to get your course created—and filled—during your 14-day trial period! Ask someone if they would be willing to walk through your course once you’ve created it to give feedback and look for any problems. And have a plan for who you will ask to join the course once it’s open. Decide whether you will upload videos directly to Ruzuku or host them on your own site, YouTube, or somewhere else (Note: videos larger than 2 GB will need to be hosted elsewhere and embedded in Ruzuku; if considering using YouTube, remember that YouTube may place advertisements at the beginning of your video) and take care of uploading to those hosting sites. Create a logo graphic with the title of the course (333px X 64px), create or choose a cover photo for the course (100px X 100px), and choose a bio photo for yourself. Once you have all of these items created and gathered, creating your online course will be a breeze—maybe even ridiculously easy! If you want an intuitive, flexible, and easy-to-use platform to get your first course online fast, Ruzuku is a great choice. It fulfills its promise of keeping all of your tech in one place (if that’s what you want), letting you upload video and audio files, host webinars and teleconferences, and create a community all on one platform. It’s not the best platform if you want to offer a certification through the course or if you want to lock subsequent content until a homework assignment has been submitted or a test has been passed. You will pay more for this platform than you would for some of the other platforms available. However, Ruzuku offers a generous 14-day trial, ongoing, speedy customer support, an extensive, targeted, and super helpful Knowledge Archive to help you get started—or get unstuck—fast, and a one-stop solution that might make course creation, community engagement, and teaching feel more like play than work. So, if you want to create a course, don’t waste two years like I did. Sign up for your free trial of Ruzuku and test it. If you use your 14 days well, you could have a course created and filled with paying students before you’ve even handed your credit card number over to the friendly folks at Ruzuku! Excellent, in-depth article, Kristine! Thank you so much. 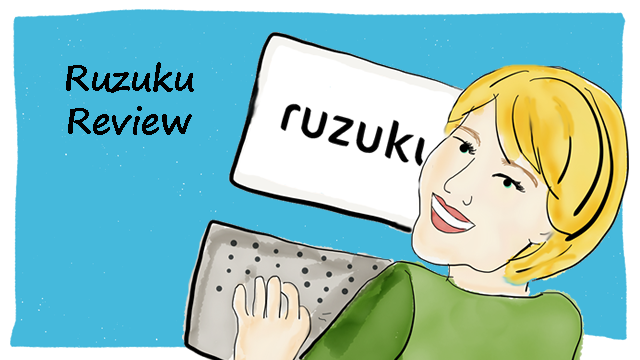 🙂 There are so many fake reviews about software, and I just love that you gave us a hands-on, personal experience with Ruzuku. Awesome! You make me feel as if I could succeed with Ruzuku; that’s an accomplishment, indeed! Hoping I can “get it” since all things “e” are tough for me. But you have given me hope and curiousity. I’m glad it gives you hope 🙂 I am confident you will be able to make this work for you, and that you will quickly get answers to any questions you do have. I’d love to hear how things go for you! Great review. Refreshing to see time taken and not just re-hashed hype. However the link to the primer is not working for me despite numerous attempts. Thank you, Leslie 🙂 I appreciate your feedback. If you try Ruzuku, I would love to hear about your experience! This is very thorough and well written! This is super helpful and valuable for non-techies! thank you Kristine!